Erected between 1310 and 1328, it was probably built by Gagliardo Primario. The 1943 bombing destroyed most part of the original Gothic style construction, as for the Baroque style transformations done, during the 18th century, by Domenico Antonio Vaccaro. After the restoration in 1953, the church was built with Gothic shapes. On the outside, the sober and austere yellow tuff façade with a triangular gable and a central rose-window, is preceded by a narthex with three ogival trachytic rock arches. The interior presents one big rectangular room with 9 lateral chapels on two sides, lighten by double and triple lancet windows. It has a wooden trussed roof. The church contains the funerary monuments of the Anjou family, among which that of Robert of Anjou. In the Clarisse choir, fragments of Giotto’s frescoes concerning the Crucifixion can be admired. Particularly prestigious is Domenico Antonio Vaccaro’s cloister, which preserves 14th century pointed arches on octagonal pillars. 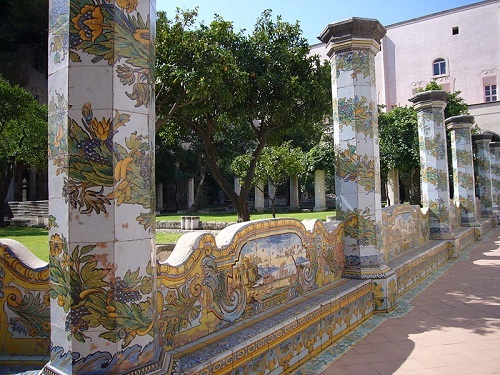 Along the bench seats and other octagonal pillars to support the pergola covered with majolica tiles. Museo dell’Opera di Santa Chiara - Set in the historical centre of Naples, near via Santa Chiara, in the area of Piazza del Gesu’ and close to San Domenico Maggiore, the Complex is inside the Franciscan citadel and includes the Museum, the Archaelogical Area, the Majolica-tiled Cloister, and the collection of Nativity Scenes (also known as Christmas Cribs) from the 1700s. The museum is set up in the environments that used to be the apartments of the convent’s nuns. The expository path illustrates the events of the construction and historical and artistic development of the Franciscan monastic citadel. The objects on display come from the church, courtyard and convent. Particularly important are the objects saved from a fire that destroyed the church in 1943. 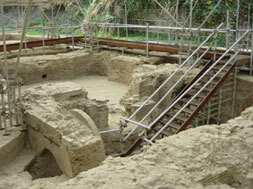 During the restoration, many archeological findings of the Roman Neapolis, on display in the museum, were found. The archeological room hosts the findings brought to light during the excavations of the Roman Thermal building, found during the restoration after the war, that occupy the entire area under the building; a room is dedicated to the history of the church, the courtyard and the convent; the marbles room hosts the fragmentary finds that couldn’t be put back in the church after the restoration and the relics room hosts, among other things, the sacred objects belonging to Santa Chiara’s Treasure.